1 year old but in two different size. Origin and Habitat: Tropical Africa (Somalia). Altitude range: 250–1600 metres above sea level. Habitat and ecology: Adenia ballyi grows in open rocky ground amongst boulders in subdesert steppe, sunny wall or embankment, usually on limestone with Boswellia carteri. The plants sometimes wedge themselves in crevices in the boulders. Description: Adenia ballyi is an odd, glabrous, shrub up to 2 m tall with sub-succulent and strongly curved spiny shoots growing from a large lumpy tuberous rootstock (caudex) to 1 m in diameter. The rootstok serves as a water reservoir in times of drought. Similar species: Adenia ballyi and Adenia globosa though not closely related to Adenia pechuelli, share something of its habit, both them resemble, large hemispherical boulders, covered with tangled spiny branches. In Adenia ballyi (and in Adenia globosa too) tendrils have been transformed into thorns. Annual stems Eccentrically arranged, non-vining, terete, greyish-green with darker vertical stripes, strongly curved, more or less woody, flexuous and spiny. Spines up to 4 cm long. Tendrils absent. Rootstock (caudex): Large, above-ground, subglobose or somewhat hemispherical, woody-succulent, grey-green up to 1 m wide topped by branches. Leaves: Grey-green, caducous, 3-lobed, broadly ovate in outline, rounded and peltate at the apex. 2.5–4 long, 2–3 mm wide, 3-nerved from the base, reticulation indistinct; petiole 1–2 mm. Glands 2, reniform, about 2 mm thick at the transition of blade and petiole, no other glands present. Inflorescences (cymes): 1–4 cm, grouped in the axils of the spines, c. 3-4-flowered. Female flowers: Tubular-funnel-shaped, 30–32 mm long including the 9–10 mm long stipe, 4–6 mm wide. Floral tube 9–11 mm long; calyx-lobes lanceolate, obtuse, 10–12 mm long, entire. Petals lanceolate, subacute, about 4 mm long, 1(–2) mm wide, minutely serrate in the upper half. Staminodes (udimentary, sterile or abortive stamen) 3.5–4 mm long, free. Corona absent. Pistil 14–16 mm long. Gynophore (the stalk of flower which supports the gynoecium ) 4–5 mm long. Ovary ovoid-ellipsoid, 7–8 x 5–5.5 mm; placentas 5; ovules c. 150; style-arms 5. Fruit: Ellipsoidal, hanging down, excluding the curved 10–11 mm long. 2) Plantes et botanique contributors. "Adenia ballyi" Plantes et botanique, Web. 6 Dec. 2014. 3) Fred Dortort "Succulent of the Month. Passion and Poison" <http://ucbgdev.berkeley.edu/SOM/SOM-passion_poison.shtml> Web. 6 Dec. 2014. 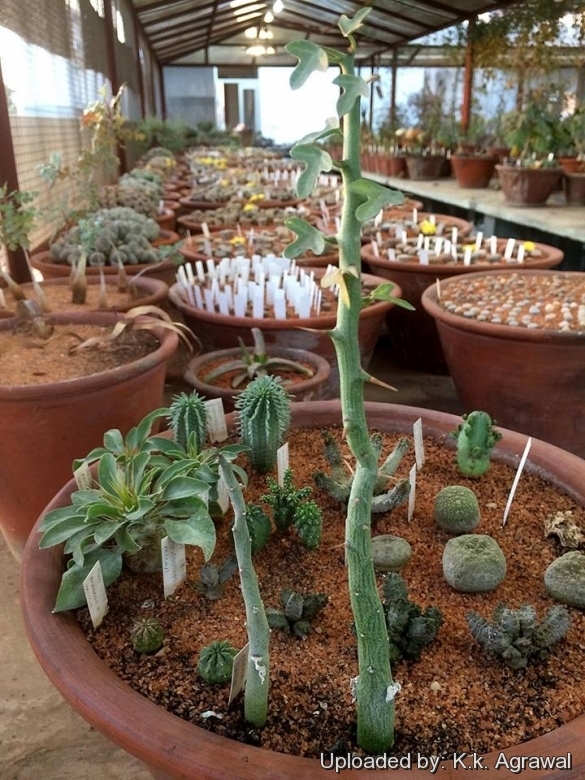 Cultivation and Propagation: Adenia aculeata is an interesting addition to a collection, but rarely seen in cultivation. It can be grown outdoors in frost-free climates and forms an impenetrable shrub if not manicured. Growth rate: It grows well, though slowly, but it possible to increase the speed of growth to some extent by providing adequate amount of water, warmth, and fertilizer during the active growing season, but it’s susceptible to rotting if too wet. Exposure: It needs light shade, but the caudex should be in the shade, while the leaves prefer some sun. Avoid direct blasting sun in summer. Bright light if grown indoors. Soil: In pots it needs a very porous potting medium (add pumice, vulcanite, and perlite). It does better in a rather acidic soil. Waterings: Water frequently while plant is in full growth, but keep dry during the winter after the branches have died back. It rot easily and do NOT like a lot of water when it has no leaves. Fertilizer: Benefits from moderate doses of a well-balanced, slow-release fertilizer. Frost tolerance: Due to its African origin keep warm in winter, the minimum safe average temperature is 15°C, although it can go lower for short periods. It can be grown outdoors in frost-free climates, need anyway to kept above 10°C and dry in winter. It is very prone to rot in cool, wet conditions. USDA Zone 10-12, but does very well in containers. Manteinance: Repot every two years. It like pots with generous drain holes. In the winter, the vining branches die back and should be cut back to encourage branching, to maintain an attractive shape and to ensure caudex habit. If pruned and kept somewhat pot bound, it can be maintained at a manageable size, depending on what ''manageable size'' means to you. Propagation: The species can be propagated by both seeds and cuttings. The plants for seed production are generally grown from cuttings since these bloom more freely. The plants for decoration are grown from seed since they develop a caudex. Warning: As with all Adenias, all parts of this plant are very toxic, and they should be handled with caution, particularly when pruning.